After all of that, some football started happening, for one team, anyway. While Houston netted twelve yards of offense and no first downs in the first half thanks to an ineffective passing strategy, Vanderbilt moved the ball relatively easily, particularly on the ground, and went into the locker room at halftime with a 24-0 lead. The Commodores’ offensive success mostly came on the ground, although some successful, big passes to Jordan Matthews projected an illusion of balance. While Houston was losing the game, we were losing the sun, so we made a change at halftime and joined the Vanderbilt faithful on the warmer side of the field in time to see the team emerging from the locker room. As we would soon learn from our new vantage point, Houston made a change at halftime too. Vanderbilt started the third quarter with the ball. They moved it eight yards in the wrong direction before punting. They fumbled on their next possession, punted on their next three possessions, and threw an interception to end the quarter. Those turnovers provided the Cougars with very good field position, and they took advantage, using just 3:53 to score twenty-four points of their own. Vanderbilt’s offense had become completely ineffective, and Houston had scored as many points in one quarter as Vandy had scored in two. 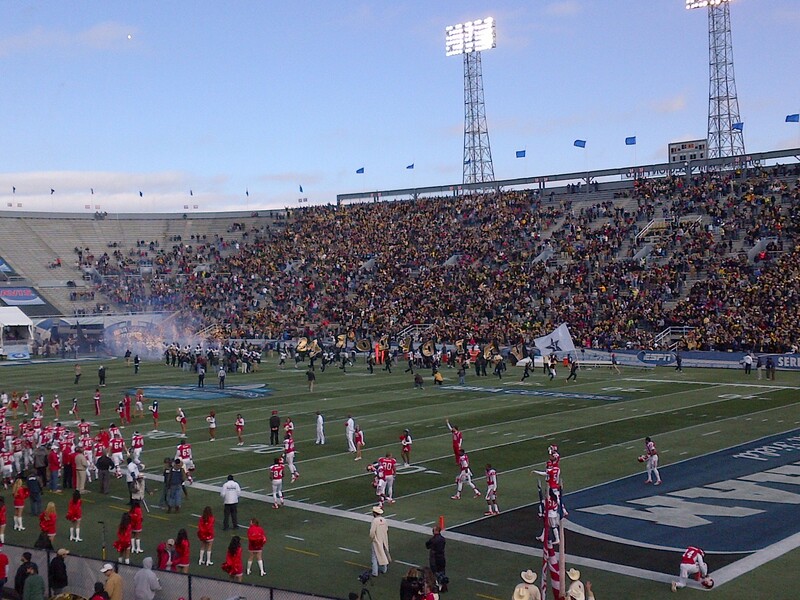 Thanks to a shift in offensive strategy, though, order returned in the fourth quarter, where the Commodores pitched a 17-0 shutout by doing nothing but run the ball, securing a 41-24 victory, their second straight bowl win (in three consecutive bowl appearances), and their second straight nine-win season. For the second consecutive season, the team finished ranked in the top twenty-five. The last three seasons have been the best in Vanderbilt football history since the 1890-1934 teams. The person who reminded everyone it is possible to win football games on West End has decamped for an allegedly happier valley, but, some individual recruiting matters aside, he left the program in such better shape than he found it that I generally expect this level of success to persist under his successor. The only question for the incoming coach is whether he can do even better. This entry was posted in ALDLAND and tagged birmingham, college football, compass bowl, houston, jordan matthews, vanderbilt by AD. Bookmark the permalink. The video was cool. I have never seen parachuters at a football game! It was a great way to start the game!